Alicia Hattersley, who witnessed the Manchester Arena terror attacks, is working alongside Manchester Metropolitan University’s Make a Difference team to create Support Sessions – an event for anyone affected by the terror attacks. The event is going to be held in MMU’s Geoffrey Manton building on the main All Saints Campus, this Wednesday, 7 June. Starting at 12p1am, the event will finish around 2pm. Talking to the NQ about why she helped create the event, Alicia said: "After seeing first-hand the attack at Manchester arena, I felt devastated and heartbroken. A few days later, however, I decided I wanted to be proactive. I wanted to create an event to help people who were feeling the same way that I was and still am." The event is for witnesses, survivors, friends and families affected. The general public, who have been touched by the harrowing attack, are also welcomed to come and share their thoughts and feelings about how the atrocity impacted them. All are welcome to the free event. The event will have numerous activities running to help those affected cope with the aftermath of the tragic event. Support Sessions will also offer an academic approach to how to manage anxiety but will also help through talking therapies anyone suffering from mental health issues. The founder of Heads Up, a mental health charity, will begin the event with a speech about coping methods, using there Cognitive Psychological First Aid approach which has been devised to help people process terrorist attacks. Between 12-2 Manchester Metropolitan’s Counselling, Health and Wellbeing team will be on hand hosting two group sessions in a safe space. The sessions will reflect on the attack, how to manage anxiety and will teach techniques to help with traumatic experiences. Alongside the wellbeing session, there will be meditation sessions to promote mindfulness after a traumatic event. Tea and cake will be provided and there will be an opportunity to donate to the Manchester attack Red Cross fund which goes directly to help the victims of the appalling attack. Alicia continued: ‘It is important for people to talk about the terrorist attack – I am lucky that I have been offered counselling by the university and my employer, others may not be able to access any sort of similar therapy, therefore, we have formulated this event to help them." 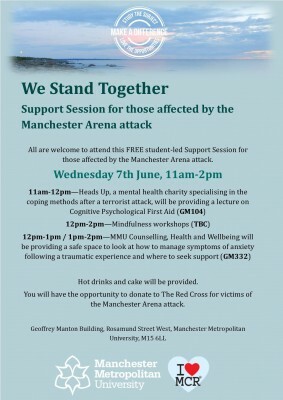 "I really do urge anyone who is affected by the Manchester terror attacks and now the tragic London terror attack which occurred last night to come along on Wednesday, even if you feel sceptical about talking about how you feel, Geoffrey Manton will be a safe, friendly place for you to come along and just have a cuppa." For more information, go to the event's official Facebook page.